The network switch is the most common network device implemented with company infrastructure and as such the selection of any new switches or upgrading is a key part of most network design projects. The Cisco network switch components include Switch Chassis, Supervisor Engine, Switching Modules, IOS/CatOS software and Power Supplies. The decision to buy new switches or upgrade equipment will be decided after considering the network assessment and design features specified. Wireless designs, as an example, will have network switches interfacing with access points. 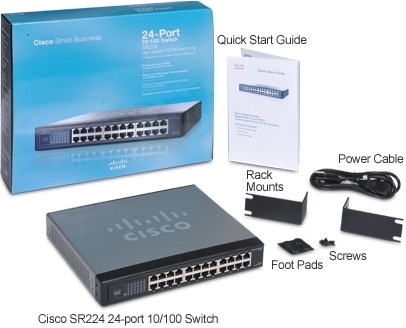 That will have an affect on the switch such as increased utilization, assigned switch ports, access control lists, Trunking, Spanning Tree Protocol and increased wattage draw from Power over Ethernet (PoE). The Switch Chassis features include - chassis dimensions, number of slots, processor slot assignments, switching fabric, engines types supported, power supplies, rack units needed. Cisco switches are implemented with an Engine (Switch Processor) for processing packets on a network segment. Routing is accomplished with an on-board Multi Layer Switch Feature Card (MSFC) or Route Processor running IOS code. The switch Engine running IOS code on the MSFC and the switch processor is in native mode, while those running CatOS on the processor are in hybrid mode. Some engines won't support native and hybrid mode. The engine with no MSFC supports what is called CatOS mode. Select the engine that matches your design specifications. The MSFC module is integrated with the Engine or upgradeable. You must implement a PFC module with any MSFC. Some Engines have no MSFC module - the routing is integrated with the hardware and as such support native mode only. The Cisco Supervisor Engine features include - supported chassis, uplink speed, processor memory, native IOS, CatOS, PFC, MSFC, slot assignment, failover.